We all know what roots are—they’re the part of the plant that’s usually underground. If we have a mental image, it’s probably a mass of wiggly, white strings poking their way through the soil. We should pay more attention to roots. After all, they’re an essential part of a plant (as well as the only part remaining after some hail storms!). Knowing a little about how roots work will make us more successful gardeners. Before I get any further, I should point out that I’ll be talking about your average, every day root. Life is an amazing phenomena, so diverse that there are always exceptions. So let’s skip the orchids (left) and other epiphytes, and the mangroves and other plants with roots growing in water, and focus on our garden flowers, shrubs, and trees. 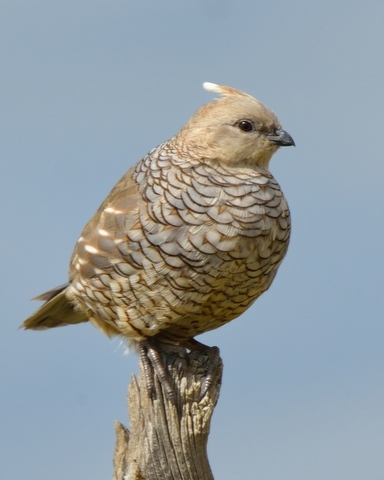 Yes, I glanced out at the feeder late one afternoon and spotted a small covey of Scaled Quail! In my yard! They were happily pecking through the shredded bark mulch looking for millet seeds that had fallen from the feeder overhead. We had a wonderful white Christmas, and the landscape is blanketed in a couple of inches of snow. But with highs below freezing and a predicted low of 10°F tonight, I was naturally concerned about the birds. Early in the morning I bundled up and ventured out to fill my feeders. I added a block of suet to my suet cage, topped off the mesh nyjer feeder, and carried a huge scoop of black oil sunflower seeds to my platform feeder. I assumed the abundant juncos, finches, nuthatches, and chickadees would keep the snow cleared enough to feed. And, for a while, they did. Are you interested in birds? Do you enjoy counting them, listing them, or watching them cavort around your backyard birdfeeder? Would you like that interest to benefit more than your natural curiosity and enjoyment? There are lots of ways that you, as a birder, can make a significant contribution to science. You don’t need to be an expert birder. It doesn’t matter how old—or young—you are. You don’t need to don a white lab coat or, in some cases, even leave the house. In fact, you can do science in your bathrobe!